The FP6600 series tripods are engineered with the user in mind. The aluminium legs are made of square tubing for added lightness and required strength. The alloy head has an integrated pulley system allowing a cable from a device to pass through the centre of the head. This eliminates costly pulleys and allows one of the 2 eyebolts to be used as an auxiliary anchorage. Retractable devices are mounted on the outside of the leg allowing more room and manoeuvrability beneath the tripod. 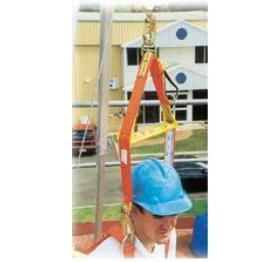 This is a block and tackle system designed for raising and lowering workers into confined spaces and for confined space rescue. The system works on a 6:1 advantage and can be purchased to whatever working depth your require. Generally this would be 10m, 15m or 20m but can be longer (remember the cost of the systems is dependent on rope length). The systems comes with its own carry bag, desired working length of rope, upper and lower blocks and karabiners for connection.